Plastics, on a worldwide basis, are measurably and observably killing and causing tremendous suffering to far more wildlife right now than any other environmental problem. Though not yet proved unequivocally, it is extremely likely that plastic breakdown byproducts (xenoestrogens) are reducing marine species’ reproduction rates throughout the food chain right now (and possibly terrestrial species as well). 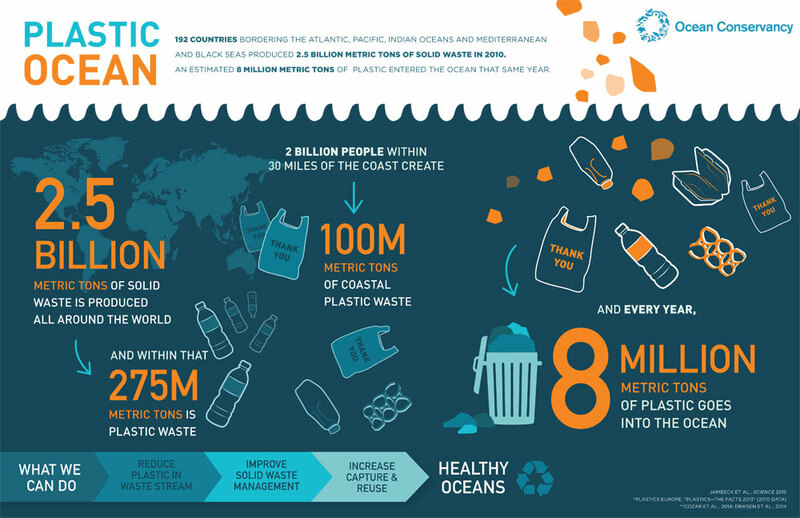 Plastic waste in the ocean breaks down into tiny suspended particles that act as sponges for the most dangerous water-borne toxins and carcinogens – PCBs, pesticides, pharmaceutical chemicals and more – which are in addition to the plastics’ own harmful compounds. Plastic particles bond these compounds into the global food chain affecting almost every living thing. Plastics are dramatically affecting human health all over the world right now in both initial usage and through the effects of environmental waste. Manufacturing of disposable plastics has a giant carbon footprint that can be more feasibly and practically reduced than most other possible contributors to climate change (double benefit). Remember that paper bags and cardboard pose their own environmental risks. Research has shown that plastic bags are better for the environment when properly disposed. Reduce unnecessary uses of both paper and plastic. Bring your saved plastic bags back to the supermarket or other drop-off locations for recycling. Plastic bags are now very efficiently recycled to manufacture valuable products that help save trees. Make sure to save and include the plastic bags from your drycleaner, newspaper bags, bread bags; plastic packaging from paper towels, toilet paper rolls and napkins; retail shopping bags (with hard plastic and string handles removed), and clear plastic bags and non-sticky bubble wrap often used in product packaging. Do NOT include plastic cling wrap or plastic bags used for prepackaged foods (e.g., frozen food bags and pre-washed salad bags). Buy a quality stainless steel beverage bottle and refill it yourself to protect both your health and the environment. Saves money, too. Plastic party and holiday decorations and serving materials are huge contributors to plastic waste – avoid and reduce their use as much as possible. If you live in an area where sorted recycling pick-up is provided (glass, metal, plastic), take the time to educate yourself and your family about how the small effort required protects the environment, wildlife and human health. Make sure to check all clear, hard-shell packaging for any visible recycle symbol as most of this material is recyclable. For food storage and preparation, use glass, ceramic and stainless steel containers. Phase out plastic containers. Durable plastic lids often sold with these containers are OK and keep food fresh without disposable plastic wrap (but don’t use them in microwave or oven). Buy fewer packaged foods and more fresh foods – better for both the environment and your health. Write your elected officials about the importance of home pick-up and community drop-off locations to make recycling practical and convenient. Stress the importance of contracting with recyclers that accept and recycle all types of plastics. Even though much larger amounts are collected, currently only about 10% of plastic waste is ever actually recycled. Write manufacturers and merchants about reducing waste in product packaging. Boxes should be no larger than necessary. Large air-filled plastic bubbles (as often used by Amazon) are superior to paper and cardboard fillers or Styrofoam-type peanuts. Reducing package weight of millions of packages saves huge amounts of polluting transportation fuel. And, the plastic bubbles can be popped and put in with plastic bags for recycling. Try to give your business to environmentally responsible companies. If you own or work for a company that packages products, implement or suggest making the changes described above. Participate in a community cleanups of parks, beaches and waterways. Hope this can help you to take small steps for improving our environment. There is no planet B guys, we should take care of this one... It's our home, and it will be the home for our children.